Since you probably have a good road bike to use during the week, mix things up a bit on weekends by getting yourself a good mountain bike that you can take out and hit the trails. As you probably already know, you can find a mtb at pretty much any price range and the amount that you should spend really just depends on your budget and what you’re looking for in a new mountain bike. 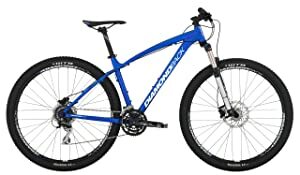 If you’re looking for a good value mountain bike for the money, then I suggest considering the Diamondback Overdrive Sport 29er. I recently had a chance to check out the 2014 bike model and found it to be one of the best mountain bikes under $600 – $800. Honestly, the price is great because you get a top-tier mtb from a well-known brand without spending a fortune. It’s hard to find a better value when comparing the best 2014 mountain bikes. Keep reading to learn more about this bike. Overall, this is a really awesome mountain bike that delivers great quality and even better features – and at a reasonable price. This is a great mtb for both beginners seeking a good entry-level mtb and mid-level mtbers who want to upgrade from a cheaper bike to this higher quality one. 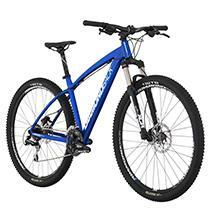 It is also a good mountain bike for taller riders as the size is more accommodating. Among some of the top features, this bike has a quick-release seat adjustment and disc brakes. However, it does not have a kickstand, which might be important to some bikers. You get an aluminum framed hardtail that really delivers great performance on the trails. You’ll enjoy the feel of the 29-inch wheels as they roll over all the obstacles on the trail giving you a nice, smooth ride. These larger wheels really do give you an quick, easy ride out there as you can manage any trail. You’ll also notice that you need to rely less on the suspension and that you get a lot of traction from the wheels. After giving this bike a test run, it gives you a great ride on trails and does a respectable job on roads. You’ll just need to remember to adjust the front suspension to whatever terrain you want to ride on. Of course, the components are not high end on this one, but that’s not surprising at this price point. Granted, this is still a great quality mountain bike (like the Shimano Acera derailleur that gives you some nice, effortless shifting) and probably the best one at this price point. Frame sizes range from small (16″)to XL (22″). And the frame itself is a glossy, sharp looking blue for 2014. 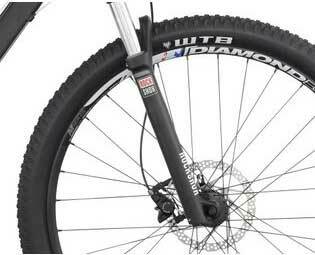 The Diamondback Overdrive Sport 29er makes riding a breeze as it can handle pretty much any obstacle in its path. The larger wheels gives you good momentum and easily roll over anything in the path. The only possible downsides are the lack of a kickstand and the seat is a little uncomfortable on long rides. Fortunately, each of those problems can be easily taken care of. If you take advantage of the free shipping option and order it online, then you will want to make sure that you carefully inspect it when the bike arrives. The Diamondback boxes are not the sturdiest shipping containers and sometimes you end up with a little damage upon arrival. So, give it a full inspection in case you need to file a damage claim to get any parts replaced. When your new Diamondback Overdrive Sport 29er arrives, it will be need to be assembled as it ships out in a few pieces. While most people put their bikes together by themselves at home, consider taking it down to your like bike shop to get it put together by some bike pros. They’ll get is all assembled and fine tuned for you and it gives you a chance to get to know them for when you want to bring the bike back in for a tune-up later. DB Key Chain, Owner’s manual, H20 bottle mounts, Clear Coat, 3 extra inches of wheel diameter! If you’re trying to decide between this model and the regular Overdrive model, let’s have a quick look at the differences to help you decide on which one best meets your trailing biking needs. The colors of the two bikes are different, which is really a trivial difference. You get blue with this one or red with on the regular Overdrive model. On this model, you get a lock out on the Front Fork and you do not on the regular Overdrive model. On this model, the bike has hydraulic disc brakes, but the regular Overdrive model has mechanical disk breaks. This model has upgraded parts compared to the regular Overdrive model. The price on this model is a little higher than the regular Overdrive model. Conclusion: this Overdrive Sport model is just the regular Overdrive model with some improvements.